If anybody wonders why, after a furious start, my Equal Opportunity Baking has somewhat slowed down - that didn't happen only because of my recent trip to Germany. My last three breads proved to be tricky, they didn't turn out quite right. One was overly spicy, one too sweet and one too dry. On the other hand, they were not so disappointing that I didn't want to deal with them again, writing a bad review, and be done, once and for all. So I will get back to them, giving each of them a second chance to live up to their potential. Though I had purchased "Bread Matters", by Andrew Whitley, a while ago, I hadn't really looked into it before I chose a recipe for my Fair Baking project. The Arkatena Bread, made with a chickpea starter, and inspired by a loaf the author found in a little village bakery in Cyprus, seemed intriguing. And I certainly go for a "bread with a hefty crust, chewy crumb, and intense flavor". Like many baking book authors, Whitley doesn't cater to the sensibilities of thrifty housewives, making his starter large enough for the needs of small bakery - only to advise you later to discard the surplus. Though I'm not a miser, I hate trashing a perfectly good guitar starter, so my first step in mastering this recipe was recalculating the amounts I really needed for one loaf. From then on it was pretty straightforward, though I have to admit I cheated a bit with the leaven. From my experiences with GF sourdough I know that chickpea flour (together with other gluten free flours), mixed with water, develops a lively fermenting activity if you just let it sit at room temperature over three days. I didn't feel the urgent necessity, though, to make a leaven from the scratch, being the proud owner of a couple of healthy and hungry starters. So, instead of going through stage 1, I used a bit of wheat starter in stage 2, deducting the amount of whole wheat and adding the missing chickpea flour (from stage 1) to the production leaven. Otherwise I followed the recipe instructions closely, but used steam for the bake, a measure Whitley, for some reason, doesn't suggest. I couldn't wait to try it! But when I took my first bite, the only thing I tasted was FENNEL! Any other, more delicate aroma was completely knocked out. 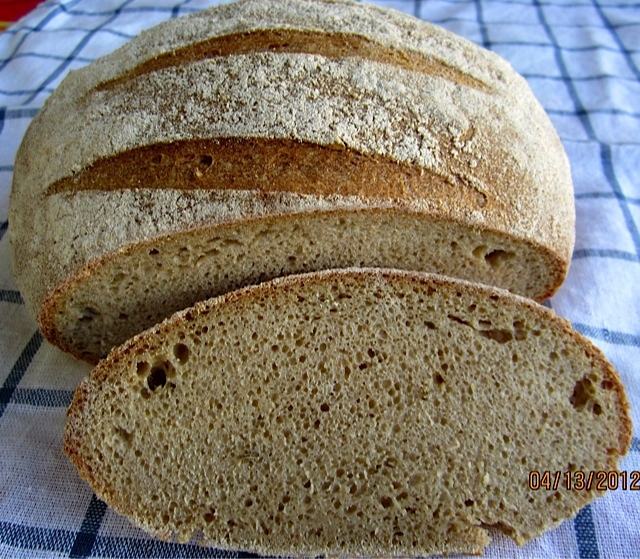 Being a German, I love breads seasoned with anise, caraway, fennel and coriander - the typical German bread spices. And I do like fennel. But only as a hint of spiciness, not as full frontal attack. 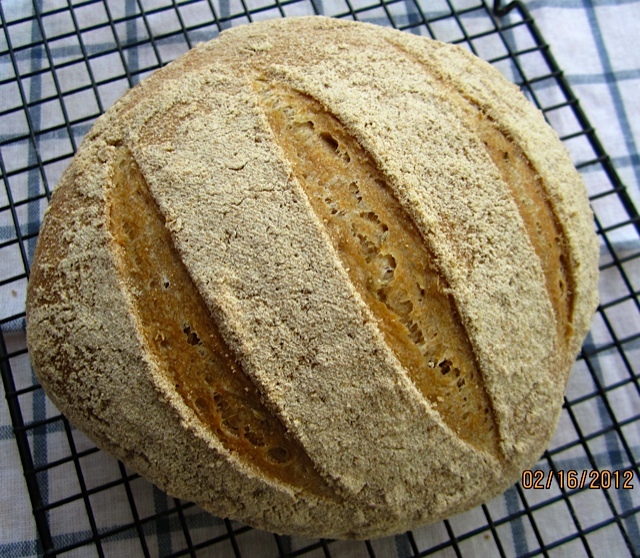 Whitley's original recipe has 6 g fennel seeds per 577 g flour = 1%! We also found the bread could do with a little more salt (it had only 1.2%). Everything else about the bread was fine, the crumb, the crust - and I still wanted to know how a chickpea leaven could flavor a bread. So, after my baking break, when I came back from Hamburg, I made another Arkatena bread, this time with a little rye starter as stage 1 leaven. I added 10 g salt (instead of 7 g). And I reduced the pesky fennel to just 1 gram. I was a little impatient, and probably should have waited another 15 minutes before placing it in the oven, it "exploded" a bit. This time it tasted really nice, with a complex aroma, and still spicy enough with a hint of fennel. Since I used a bit of mature starter, the overall development of the leaven didn't take 3 days, but only one. 1. Prepare 3-step starter. Let the first step leaven sit for ca. 6 hours, the second one for ca. 4 - 6 hours, and production leaven for 4 - 6 hours, or overnight. 2. Mix a dough with all ingredients except fennel and leaven, 8 - 10 minutes of vigorous action. Dough should be soft and elastic (82ºF/28ºC). Add starter and fennel, and work a few minutes more until smooth, but still somewhat sticky. 3. Transfer dough to a moistened work surface, cover with an upturned bowl (sprayed with water). Let rest for 1 hour. 4. S & F, using a scraper in each hand. Dip dough ball gently in a bowl with whole wheat flour, so that it's completely covered. Place in floured proofing basket, seam side up. Let proof for 3 - 5 hours (poke test, mine took about 4 hours). 5. Preheat oven to 425ºF/220ºC, including steam pan. Invert basket onto parchment lined baking sheet. Score 2 - 3 times. 6. Bake for 10 minutes, reduce heat to 400ºF/200ºC, and continue baking for 10 minutes. Rotate, and bake for another 20 - 25 minutes. NOTE: When I make this bread again, I would try working with autolyse, instead of long "vigorous" kneading.